As president and CEO of Scripps Health since 2000, Chris Van Gorder has been instrumental in positioning Scripps among the nation’s foremost health care institutions. Now he is leading the restructure of the $2.6 billion, integrated health system to best prepare for the changes of health care reform. At Scripps Health, Van Gorder oversees all functions of the integrated health system, including its five acute-care hospital campuses, dozens of outpatient centers throughout San Diego County, and a regional home health service and hospice. More than 15,000 employees and 2,600 affiliated physicians provide care at Scripps, which has made the Fortune magazine “100 Best Companies to Work For” list for eight consecutive years and in 2013 was named by Becker’s Hospital Review as one of the 100 Great Places to Work in Healthcare. Scripps was also recently named by AARP as the No. 2 employer in the nation for workers 50 and older. Named CEO shortly after arriving at Scripps in 1999, the organization was losing $15 million a year, and employee and physician confidence had hit bottom. Van Gorder responded with a transparent, co-management style, configured an award-winning executive team, streamlined business operations and focused on internal efficiencies, physician relations and workplace culture – leading to a landmark turnaround. Scripps now has its sights on regional growth and expansion, more than doubling its outpatient neighborhood locations, and expanding on nearly all its hospital campuses. The organization’s $2 billion growth and expansion plan for the San Diego region includes two new critical care centers, a landmark cardiovascular institute, and a new radiation therapy center, which opened in 2012. The Scripps Proton Therapy Center opened in February 2014, one of only 15 in the United States. Van Gorder’s rise to health care executive has been unconventional. His journey began as a hospital patient, when as a police officer he was critically injured during a family dispute call. After a lengthy recovery and starting a new career in hospital security, Van Gorder continued his education in health care management and rose to levels of increased responsibility. He continues to serve the public as a reserve assistant sheriff in the San Diego County Sheriff’s Department, in charge of the Law Enforcement and Search and Rescue Reserves. He also is a licensed emergency medical technician (EMT) and an instructor for the American Red Cross. In 2006, Van Gorder’s volunteer work was honored with the Maltese Cross Award by the San Diego County Fire Chiefs, and again in 2007 with the MedAssets Outstanding Humanitarian Award. In 2007, he also received USC’s prestigious Guardian Award for his significant achievements in health care and commitment to the community. In 2009, he received the distinguished B’nai B’rith National Healthcare Leader award. Van Gorder received his master’s degree in public administration/health services administration at the University of Southern California, completed the Wharton CEO Program at the University of Pennsylvania and earned his bachelor’s degree from California State University, Los Angeles. 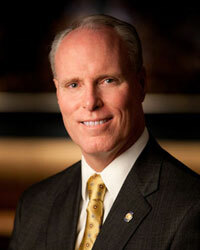 In 2006, California’s governor appointed Van Gorder to the California Commission on Emergency Medical Services (EMSA) where he served two terms. In 2007, the U.S. Secretary of State reappointed Van Gorder to the U.S. Commission for the United Nations Educational, Scientific and Cultural Organization (UNESCO). He is a Professor of Practice (Health Management) at the University of Southern California, where he also serves on the Board of Councilors of the university’s school of policy, planning and development. In addition, Van Gorder is a member of the editorial/advisory boards of HealthLeaders, Becker’s Hospital Review and the Governance Institute. In 2008, Van Gorder and his executive team were named the Top Leadership Team in Health Care for large health systems by HealthLeaders magazine. And in 2014, Modern Healthcare magazine named Van Gorder one of the nation’s “100 Most Influential People in Healthcare,” the sixth time he has been included on the coveted list. Van Gorder was part of medical history following Hurricane Katrina in 2005, when U.S. Surgeon General Richard Carmona, M.D., asked a Scripps medical unit to staff a temporary clinic for hurricane survivors in the Houston Convention Center. The request for Scripps’ assistance marked the first time the federal government asked a private health care organization for long-term support for a nationally organized disaster relief plan. The Scripps Medical Response Team later provided community medical support following the 2007 San Diego County wildfires, and again in January 2010, when Van Gorder and the Scripps Medical Response Team traveled to Port au Prince, Haiti to aid victims of the devastating earthquake. Today, the Scripps Disaster Preparedness Office provides counsel to local, state and federal disaster efforts. In October 2010, Van Gorder announced a new direction for Scripps Health. In anticipation of dramatic change in health care, he “turned the organization on its side,” creating a horizontally matrixed management structure to identify and significantly reduce unnecessary variation in patient care and health care operations. The new approach led to $224 million in performance improvements from fiscal years 2011 to 2013, with a $97 million goal for FY 2014. Continually striving to reduce cost and inefficiency and bring more value to patients, Scripps is one of a handful of health care systems integrating Lean business concepts as part of its ongoing business strategy. Its “Value by Design” efforts are successfully engaging front-line employees and physicians in everyday work and process solutions. Van Gorder’s first book – The Front-Line Leader: Building a High Performance Organization from the Ground Up – was published in November 2014. He now regularly writes on leadership, corporate culture and health care through his front-line leadership blog – #Frontlineleader – and on Twitter @ChrisD.VanGorder.